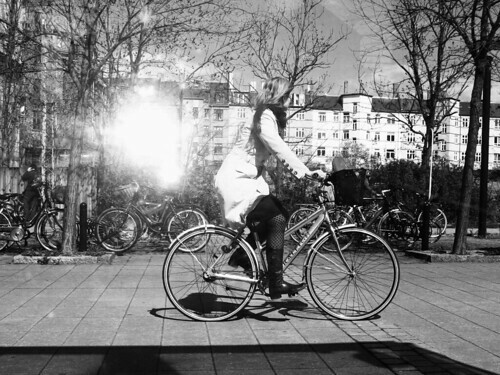 A Copenhagen cyclist crossing the bridge in Nyhavn, the old pictoresque canal on the harbour. Doesn't get much more Copenhagen than this. Spring is here. Repeat after me. Spring is here. A fragment in time on The King's New Square in Copenhagen. But, here, it's p*ss*ng down. Great idea and great blog...love it. I love these bikes. Over here in England, you only get big, chunky 'mountain bikes' which are uncomfortable and not so prtactical for city cycling. Apart from Pashley, that is - they make really nice bikes, very good quality (and very expensive). Nice to see people riding bikes without helmets. In Australia we are not allowed to let the wind in our hair and I miss it sooooo much. Great site. The weather isn't conducive to cycling as a mode of transport here in Australia, but I can wish it was. Umm, Sev, what do you mean 'The weather isn't conducive to cycling as a mode of transport here in Australia' ? I'm in Australia and today we had a clear blue sky all day, around 23 degrees and an occasional light breeze. What I mean is that I cycle as a sport, where sweating and arriving red faced is acceptable. I couldn't cycle to, say, university if I wanted to keep my friends. I would smell awful and have clothes drenched in sweat. Magnifique!! Here in Montreal , cyclists dont wear lycra stuff and helmet but they dont have the style. 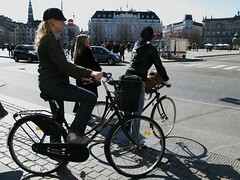 Danish are so beautiful, they are so class on there bike. Last year, me and my girlfriend, make a trip to Scandinavia. We begin whith Copenhagen. Arrive in Stockholm, we cancel the train to Norway and return to Copenhagen on the fastest train, take a beer outside and watch bike traffic. Thats life! sev: ride your bike slower... :-) it's transport, not a sport. steph: you made the right choice!